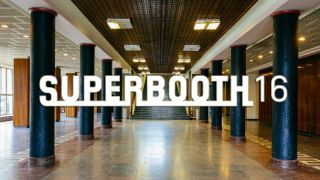 For the first time, Superbooth is heading for the Funkhaus in Berlin for a totally new fair and festival of electronic music. What originally started out as a small stand at Musikmesse, Frankfurt, 15 years ago, has outgrown one of the world's biggest music trade shows and struck out on its own. The event runs from 31 March to 2 April 2016 and isn't just your average trade show, but a festival of culture celebrating the Berlin music scene. Numerous big-name brands such as Native Instruments, Yamaha, Roland, Korg, and Dave Smith Instruments have announced their attendance. They will, of course, be joined by a cacophony of Eurorack synth manufacturers and many other synth makers besides. But it's not all about shiny new toys. The show will also host numerous presentations, demonstrations, discussions and DIY workshops, plus a program of live shows on Friday and Saturday evening in the special Funkhaus Culture Hall. MusicRadar will be on hand to bring you all the news from the show floor. But what do we expect to see this year? Access has already teased us with the Virus TI Darkstar synth relaunch, but let's hope the company has more to show us - it's been a while. Next up would be the Korg Volca FM, which we saw at this year's NAMM, albeit in a very raw state. It will no doubt have a big presence, and we hope to get our hands on the finished article after seeing Korg's latest demo video. We will be updating this page with news and teasers as and when they land, so be sure to keep checking back for more on Superbooth16.